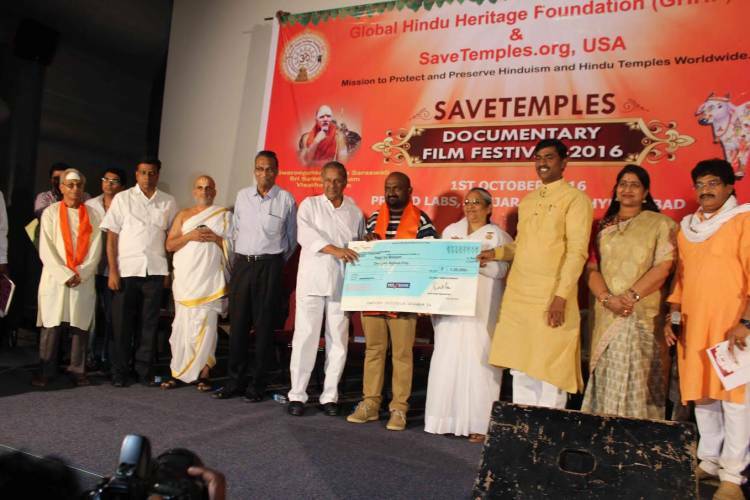 As many of you know that Global Hindu Heritage Foundation was started in 2006 with a mission to make every effort to REPEAL the Hindu Religious and Charitable Endowment Act, restore the independent management of Hindu Temples by Hindus themselves, make Hindus aware of the plight of Hindu Temples in the hands of government, ensure that the Hindu Temple lands are not auctioned or sold, urge the government to renovate and repair all the dilapidated Gopurams and Temples, recover all the lands that were encroached illegally or obtain market value for these lands, approach the government to rectify the abuses of Hindu Temple assets, challenge the sale and encroachment of Hindu Temple lands, advocate the implementation of Article 48 to protect the cows and close down the slaughter houses, revive the pride and prestige of the glory and grandeur of Sanatana Dharma, and encourage implementation of various activities to that make Hindus appreciate the meaning and significance various rituals. A case was filed in the Supreme Court by Sri Dayananda Saraswati in 2013 and Dr. Subramanian Swamy agreed to represent the case to repeal the Endowment Act freeing the Temples from the government control. The case came to the Supreme Court in July and it may continue for a couple of years before the decision is made. We are all hopeful that the Endowment Act will be repealed allowing Hindus to manage their Hindu Temples the way Christians and Moslems manage theirs without government interference. 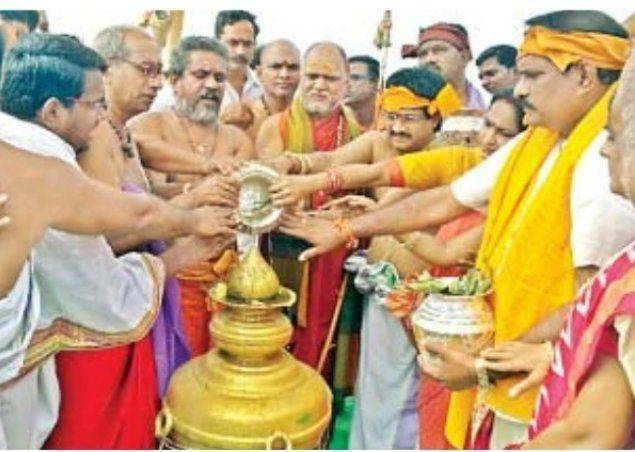 Vakula Mata Temple case was resolved with the High Court clearing the way to build it by TTD. We are hoping that Ground Breaking Ceremony will be started very soon. Then the question is “Why did the government taken over the Hindu Temple?” It is because of Hindu indifference, silence and tolerance. It is time for all Hindus to look at the governmental discrimination against Hindu Temples and Hinduism. 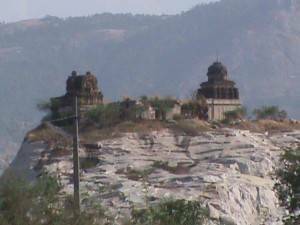 Your contribution would help us continue the struggle to free Hindu Temples soon. 14726 Harmony Lane, Frisco, Texas 75035. Krishna Janmashtami to be declared as Gopuja Dinotsava Day. GHHF submitted a letter requesting the Sri M Manikyala Rao, the Minister for Endowments requesting him to declare Krishna Janmashtami as Gopuja Dinotsava Day. Since the Repeal of Endowment Act is being heard at Supreme Court, Dr. Subramanian Swamy suggested that we should take up the task of writing a Constitution for the Management of Hindu Temples. We have selected two people who are knowledgeable in the matter who have agreed to undertake this task. Work is in progressing. Gopuja Dinotsavam - Government of Andhra Pradesh accepted our request and issued a G O (Government Order) on April 1, 2016. 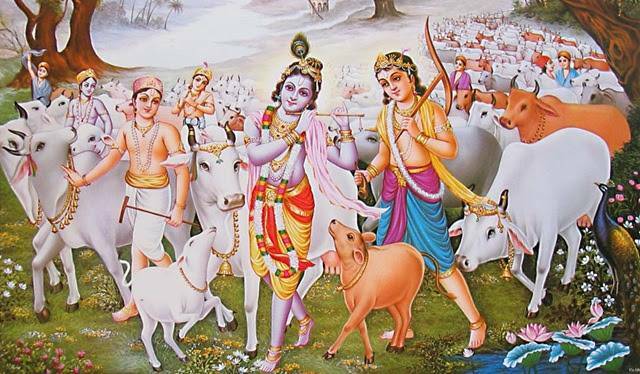 The GO reads that, “it is appropriate to declare Sri Krishna Janmashtami as Gopuja Dinotsavam and encourage people to worship the cow and protect the cow. Kumari Sanskriti Kesiraju, daughter of legendary Dr. Ghazal Srinivas sang a number of Ghazals with meaningful content at Karya Siddhi Hanuman Temple. This child prodigy was very much appreciated for her soulful singing. Smt. Savitri Jayanti, Harikatha Artist from Annamacharya Project at TTP performed Harikatha narrating the story of Bhakta Ramadas on June 25 at Karya Siddhi Hanuman Temple. Diwali Stamp:GHHF has actively campaigned requesting all Indians to sign the petition to issue DIWALI postal stamp in USA. 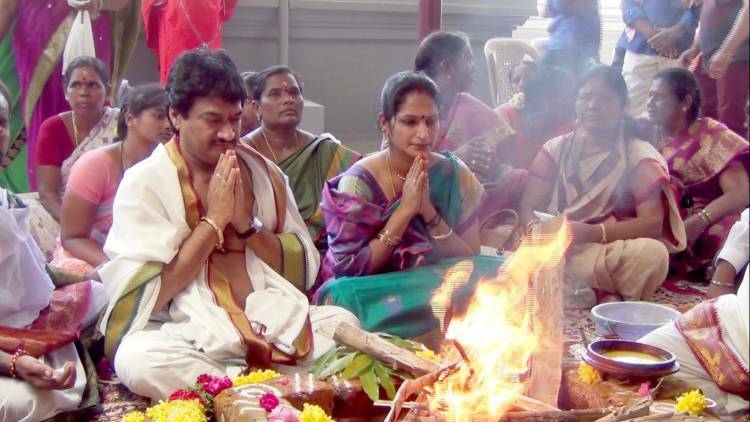 Chandi Homam - Dr. Ghazal Srinivas couple have performed CHANDI YAAGA in Amaravati Punyakshetram in Guntur District successfully. 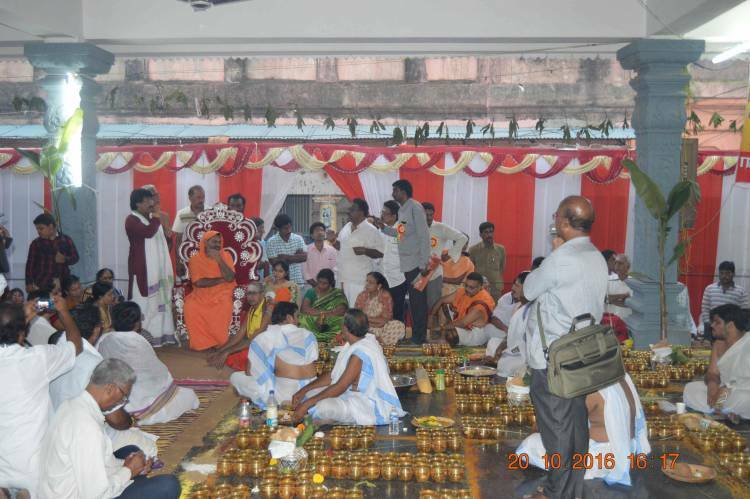 To make Krishna Pushkaralu as successful, GHHF & Savetemples.org Organized CHANDI YAAGA with the support of Hindu Drama Rakshana Parishath of Guntur District, Former Minister Shri D. Manikya Vara Prasad, Mr. Venu Gopal from Vishwa Hindu Parishad, Darshanapu Srinivas were attended the Homam. His Holiness Shri Viswanji Maharaj attended the event and participated in the CHANDI YAAGA. On August 6, he spoke at the Karya Siddhi Hanuman Temples addressing on the “Relevance of Hindu Customs and Traditions” followed by question and answer session. On August 7, h spoke on Gomata, Gopuram and Gurukulam and the need to promote them to preserve our Hinduism at Singley Auditorium in Irving TX. 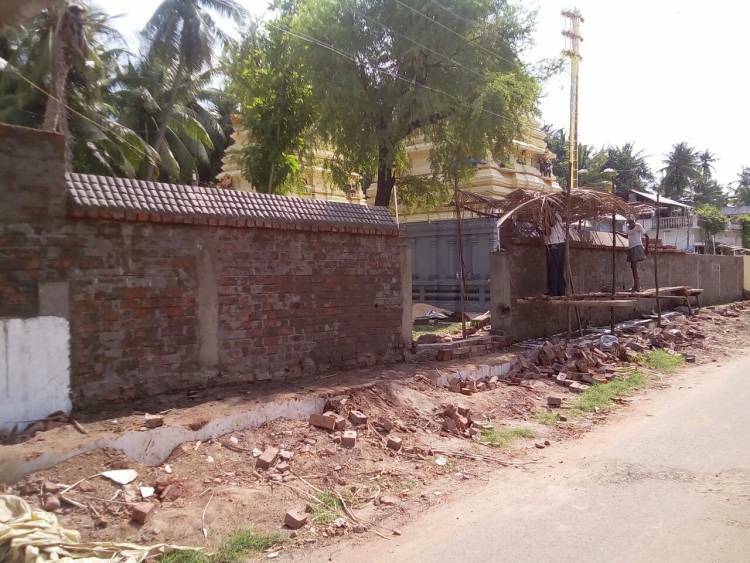 A compound Wall around Sri Menakeswari Temple in East Godavari District was constructed by our organization. Prime Minister Sri Narendra Modi releases a CD on Tiranga Yatra to mark the 70th anniversary of India’s Independence. 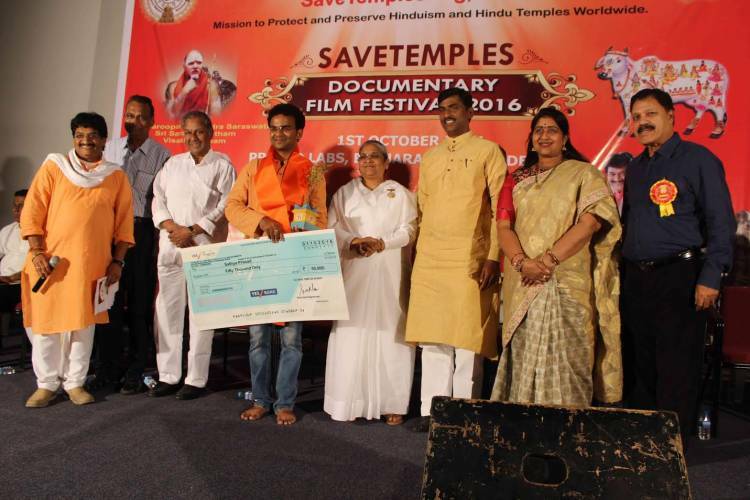 SaveTemples International Documentary Festival On “Our Native Place – Our Ancient Temple – Past & Present” was conducted on October 1, 2016 at Prasad Labs, Hyderabad. Dr. Raghavendra Prasad attended the function. 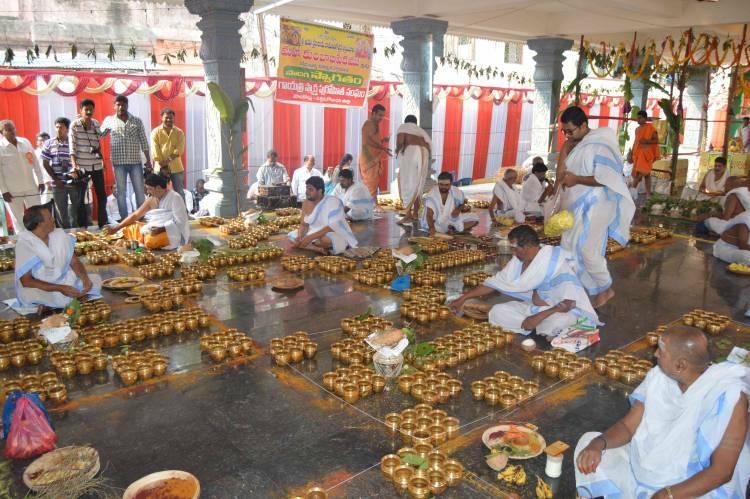 Maha Kumbabhishekam was performed in Sri Ksheera Ramalingeswara Swamy Temple in Palakol, West Godavari on October 20 and 21, 2016. Dr. Raghavendra Prasad also participated in the function. Sri Swaroopanandendra Swamy, Peethadhipati of Sri Sharada Peetham from Vishakhapatnam inaugurated the ceremony and blessed the event. He urged all Hindus to practice Sanatana dharma and take full responsibility to protect Hindu dharma. Sri Paripoornananda Swamiji, Peethadhipati of Sreepeetham, Kakinada exhorted all Hindus to apply tilak on the forehead, respect parents, respect the sacred cow, visit the Temples and do suryanamskaram in the morning every day. Attended as a special Guest to celebrate Sahasrabdi of Sri Ramanuja Chary of 10th century organized by JET USA under the auspicious guidance of Sri Tridandi Chinna Jeeyar Swamy on November 19th. Suprabhatams were sung by Dr Ghazal Srinivas for these Temples to be played in the early morning hours at the request of these respective Temples. In 2013, GHHF has written a letter requesting TTD to allow us to construct Vakula Mata Temple as per the guidelines and Agama Sastras. 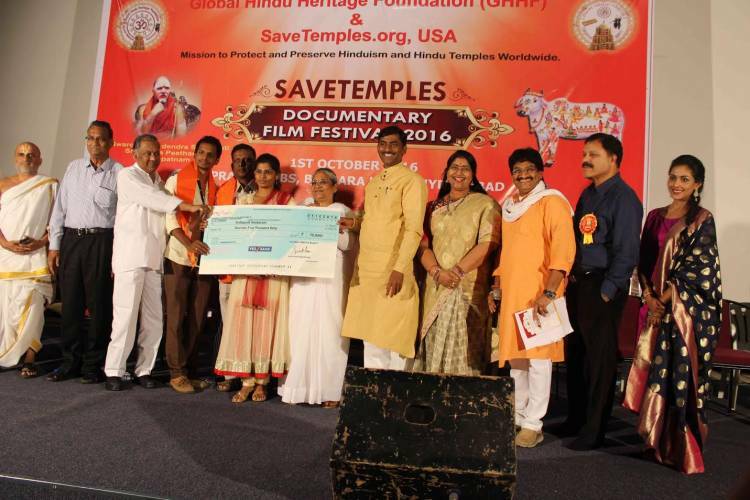 Motivational Song: Sri Ghazal Srinivas sang a Motivational Song on "Construction of Vakulamata Temple " at Perur, near Tirupathi for the commitment and dedication to the mission of SaveTemples & GHHF organization of USA. We Salute Sreepeetham and Bharath Today channel for all their Dedication. Hindu Singles - Participated in the discussion and planning of arranging an occasion for Hindu Singles to meet to create opportunity to find potential Hindus partners with the intention of their eventual marriage alliances. Meet and Greet was arranged on November 26th. Dr. Bala Murali Krishna Passed away: Following the death of Dr. Mangalampudi Bala Murali Krishna, on behalf of GHHF and SaveTemples organization, Dr. Ghazal Srinivas conducted Hrudayaanjali on November 26 in Indian Medical Association Hall in Vijayawada from 9:00am to 6:00p. Dignitaries who attended and spoke at the Condolences ceremony include Sri Kodela Siva Prasad, Sri Gollapalli Surya Rao, Sri Jonnavithula Ramalingeswara Rao, Sri Annavarapu Ramaswamy, Sri Pemmaraju Surya Rao, Sri D V Mohana Krishna, Sri Eelapata Sivaprasad and many others. In his village in East Godavari District, Government should establish University and Museum recognizing his contribution to Carnatic Music. Award Bharata Ratna recognizing his contribution to music.